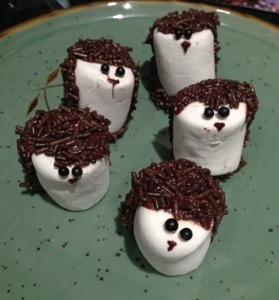 I saw these online but since my kids aren’t big on coconut, I thought I’d try using chocolate sprinkles. Just dip part of a marshmallow into melted chocolate and roll in sprinkles. The eyes are black dragees “glued” on with melted chocolate.